WB Games has announced today that Mortal Kombat (2011) will receive a re-release that contains every downloadable fighter and costume skin/fatality released as DLC. The new Komplete Edition will also include digital downloads of the Mortal Kombat: Songs Inspired by the Warriors album released last year and a download of the 1995 film Mortal Kombat on PSN and Xbox Live. Check for this release in stores on Tuesday, February 28th. Mortal Kombat Komplete Edition delivers the critically acclaimed game, all previously released downloadable content (DLC), plus digital downloads of the 2011 release of Mortal Kombat: Songs Inspired by the Warriors album with a bonus track, and the 1995 Mortal Kombat film on the PlayStation(R)Store or Xbox Live Zune. The DLC includes fan-favorite warriors Skarlet, Kenshi and Rain, as well as the infamous dream stalker Freddy Krueger. The game also offers 15 Klassic Skins and three Klassic Fatalities (Scorpion, Sub-Zero and Reptile). Mortal Kombat: Songs Inspired by the Warriors is a collection of electronic music inspired by the game and is executive produced by JFK (of the DJ/production duo MSTRKRFT and Death From Above 1979). No word on pricing. This is was the second of the three NetherRealm surprises mentioned by Ed Boon. Great news! I want the movie so bad for some reason. They need to release the UMK3 Ninja Costume Pack. So is this koming to PC? There is no extra content :/. So im not buying this as i have all the DLC. if there was exclusive content like arenas and animalities etc i would defo buy this version :P.
Scoprio, I don't think you realize this isn't for those who already have the game. There will not be anything new. No new stages, no new modes, no new characters. It's just another way to ramp up interest in the game again with all the DLC and soundtrack in one place. I'd be taking the time remind those who haven't bought it to take the chance to buy this release. Same here. It's good to see that NRS is still supporting MK9 and with this re-release, it will be a great chance for those who don't have the game to purchase it with all the DLC, the soundtrack, and movie. Sounds like a good bargain to me. Just a lame excuse to get money. This is great news for me really. Ill be getting this for sure since I don't have the game yet. The release date is great as well since I planned to get a ps3 sometime around then. Thank you NRS! They can't release something that hasn't been developed. It has already been confirmed that there is no more DLC. 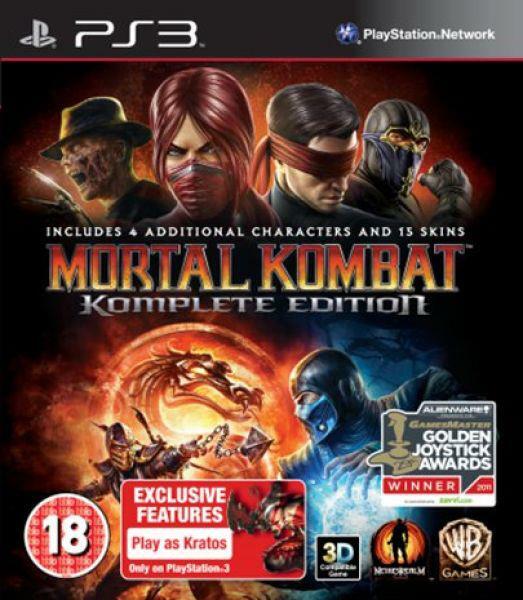 And I wanted to buy MK9 for PS3, now I can buy this and I will have all the DLC I just hope it doesn't take too long to release it here in Brazil, and also I hope it's not more expensive than normal game releases. I just got an XBox 360, so I'll be getting this for it. Works out alright for me! ^^ This. Agreed 100% A few extra stages / extra klassic fatalities would have been a good incentive for me to get it, as well. Also, what was Surprise #1? Was it the announcement of MK coming to the Vita or the involvement in Arkham City Lockdown? I'll keep my MK until I know there are other extra stuff that I'd truly find more interesting such as new fatalities, characters, costumes, and etc. And what was the first surprise again? Also, I'm guessing that the third surprise or at least a surprise for us in this game will be that boss characters will be playable in this version. If so, I'd love to team up Kahn with Sindel! the way I see this, it's a rip-off for people who already have the game and all of the kontent, MAYBE if it at the very least had achievements I would buy it for myself. but this isnt all bad my friends who dont already have the game could buy it for what 40 dollars? I wonder if all the stats for each kharacters in the og MK9 will be transferred here or will I have to start all over? I hope at least the DLC kharacters have their own spots at the Nekropolis. I know that the stats for the DLC's don't show up in the og MK9, but is it possible that they were still stored somewhere? Great...I have 2 reasons not to buy a) I have all available DLC already (though I'm still trying to convince my cousin to buy Klassic Kostume pre-order and Skarlet) b) I have no reason to believe that all available DLC will be delisted on XBL or PSN. As someone who got the game on day one and was expecting some more DLC all I can say is... meh. Yeah, I know Ed Boon said there wouldn't be more DLC... but let's face it, the man has a tendency to lie. I'll probably be selling my original copy and will purchase this. Will this game still be compatible with the origional MK9 game for online play for those that still wish to stick with the first version they purchased in 2011? I wouldnt see why not i mean its the same game right? Good way to attract new players and kollection enthusiasts, but I will not be dropping any dollars on this. If it is indeed only the DLC that is included, then I am totally okay with just skipping this, unless the last surprise by Boon is something extra for the Komplete Edition. I wonder if this will be banned in Australia, as well. Hey guys lets all buy a "Komplete Edition" with included DLC that only has a 50% chance of working online! Huzzah! Surprise? Yeaaaaaaaaa no. Do Final Secret in MKDA and Super Unlockable in MKD ring a bell? Or how about the status of MKSM's canonicity made by his staff? If MKSM's story was strictly canon, it would have been really boring. Im glad they did not go that way. Also, what was Surprise #1? And what was the first surprise again? Also, I'm guessing that the third surprise or at least a surprise for us in this game will be that boss characters will be playable in this version. If so, I'd love to team up Kahn with Sindel! The third surprise is unexpected one. No way is it playable bosses. will this be a US only edition or will the rest of the world have this version too ? anyone knows ? That's part of the reason that I think it's an MK action adventure game. Everyone already expects MK on the the Vita. An announcement for MK Vitality on the PS Vita wouldn't really be "unexpected." mk ke was supposed to be a surprise but it got leaked way before the announcement. it was supposed to be a surprise. i expect the same for vitality. it may be intended to be the 3rd surprise thats already been blown, but he cant say until the official announcement. Mortal Kombat for ps vita was already confirmed last month at an event held by Sony in london. So I don't think it is the third surprise. I've said it a bunch of times, but a Shaolin Monks sequel starring Sub-Zero and Scorpion would be AWESOME!!! I'm hoping it's something along those lines. wish the original boxart could have looked something like that. With characters above the logo. Probably would have used the more famous ones like Kang, and Raiden and 2 others. 'Batman: Arkham City Lockdown' The third surprise is unexpected one. No way is it playable bosses. Ok. Whatever it is, it better be some kind of update for not only the MK:KE but also for the original MK9 game!!! Or, it should be related to another new MK game. NOT BATMAN!!! I hope at least the DLC kharacters have their own spots at the Nekropolis. Agreed! No Nekro spots for the DLC characters was a major bummer. Alt costumes for the DLC characters would also be nice but I won't hold my breath. They aren't directly available in the Nekro, but you can still access their bios and toggle damage. Once in the Nekro and viewing a character, press start and back out to the player selection screen. Then choose Skarlet, Kenshi, Rain, Freddy. You can also view DLC costumes this way too. However, it would just be easier to put them proper in the Nekro lineup so endings can be viewed on demand too. Yeah I know. Still I'd like to see them get a proper spot in Nekro just so it feels more "complete" for lack of a better word. Plus I'd like to see what my stats are with Skarlet. ****yawn**** about what I expected from this outfit. Making bosses playable in MK is no different than legalizing the use of steroids and performance-enhancing drugs in sports. I seem to recall someone named Sablicious at NRS's MK forum threatening to not only cancel his MK9 pre-order, but also threatening to pirate that game if "his main was non-playable" (his main, of course, being Shao Kahn). Well, that's his problem right there. I'm sorry, but, what type of moron MAINS a non-playable BOSS character in the MK universe? Besides, the threat of 1 guy ins't going to make NRS change their mind. I'm sure that NRS WB can trace his username back to the e-mail that he signed up with, and put out a lawsuit on him. another way to make money this is ********. Well, that's his problem right there. I'm sorry, but, what type of moron MAINS a non-playable BOSS character in the MK universe? I can answer that question; a cheater (hence why I compared it to steroid/PED use in sports)! And I know someone will bring up Tekken and SF as examples of fighting game franchises who make bosses playable, but comparing that to MK is clearly comparing apples to oranges; SF bosses from SFII'CE onward and Tekken bosses for the first 4 games were designed to be playable characters, whether by default or through unlocking, and were declared bosses for storyline purposes only (though Tekken 5 & 6 do have unplayable bosses that were designed to be true bosses). MK bosses, on the other hand, were designed to be bosses, and thus are unplayable for a reason. The only reason Midway made any of them playable in ANY games to begin with was as a novelty item. MK bosses, on the other hand, were designed to be bosses, and thus are unplayable for a reason. The only reason Midway made any of them playable in ANY games to begin with was as a novelty item. Agreed 100%. Also, Shang Tsung doesn't count as a "playable boss," for any one who was conjuring up that counter-argument. He was only unplayable in MK1, like Reptile. Believe it or not, Shang Tsung was a de-facto sub-boss in MKII, despite being playable and having no boss-like attributes, as he was positioned right before the game's bosses in 1-player mode in every ladder configuration. This situation repeated itself 4 more times in MK history; in MK4 (with Shinnok as the final boss), MKDA (with Shang Tsung and Quan Chi as the final two bosses on an alternating basis), MKD (with Noob-Smoke as a sub-boss), and MK9 (Shang Tsung with the same situation as MKII). Those were really the only times in MK's history where playable characters played the role of "de-facto bosses" (and in most cases, they were for storyline purposes, such as symbolizing their status as the main villain of the game's story). I think this is bull, they adding all the old stuff that all the real mk fans allready have hoping to get some people to buy the same mk again. They're releasing this for the people who haven't bought MK9 yet, I don't see a problem with that, it's not like they're tempting us to buy it again by adding a few new costumes, now that would be bullsh*t.
I don't see the big issue with this. It's just like any other "Game of the Year" edition. It's not geared toward people who already own the game because why would they buy it? They wouldn't. It's geared toward people who are late to the game. People who have had MK9 since day one like me have been playing it for a year while others have been missing out. So what if they get it with all DLC for a cheaper price? I think I got the better deal. Wonder if dlc fighters will be in the necropolis. If so, woul mkke have a separate trophy list than MK? 2nd plat time? Wonder if dlc fighters will be in the necropolis. If so, would mkke have a separate trophy list than MK? 2nd plat time? A legitimate question, but I doubt a new trophy pack will be made for it. Not saying it's impossible, though. And I'd like to see DLC kharacters make it into the Nekropolis, that would be a nice addition. Maybe this is an opportunity for them to include all trailers and character vignettes (that the PS3 got as exclusives) on Xbox Live for free downloads! Do you really need them when you actually own THE game? I can't speak for myself because I don't have a console. Oh are you kidding me, I was about to buy the game. Oh well, I was only interested in Skarlet and Rain. But I can wait for this. Well I just sold some games today and got quite a bit.I'm officially getting this.Its good for me because I dont have XBL. Before Skarlet was even released, the game was hacked and supposedly she had an alternate costume. Same thing with the alleged hack where a basic model character is shown on the select screen and when chosen, the announced says, "Fujin". All things considered, everything is hype, speculation, and rumor until official word falls from the lips of the folks at WB/NRS. Hey guys, I just noticed something down the bottom of the page on the announcement thing for the Komplete Edition and I just wanted to know if it meant what I thought it meant. http://www.mortalkombatonline.com/content/News/read.cds?article=1614 Anyway down the bottom it mentions "Komplete Edition gains new content and features in April when a version is released for PlayStation Vita. Taking advantage of unique hardware abilities, the title adds interactive balance and touchscreen features, along with console exclusive content." I might be reading it wrong but I think it says that the Komplete Edition will be getting new stuff in April closer to the release of the Vita one. I am hoping that it means we might get new Costumes and new features like the ones for the Vita. Obviously things that are Vita exclusive won't be included (like touchscreen) but I am hoping that NRS hasn't abandoned the console ones just yet without the Vita costumes. What do you think? Hey guys, I just noticed something down the bottom of the page on the announcement thing for the Komplete Edition and I just wanted to know if it meant what I thought it meant. [URL]http://www.mortalkombatonline.com/content/News/read.cds?article=1614[/URL] Anyway down the bottom it mentions "Komplete Edition gains new content and features in April when a version is released for PlayStation Vita. Taking advantage of unique hardware abilities, the title adds interactive balance and touchscreen features, along with console exclusive content." I might be reading it wrong but I think it says that the Komplete Edition will be getting new stuff in April closer to the release of the Vita one. I am hoping that it means we might get new Costumes and new features like the ones for the Vita. Obviously things that are Vita exclusive won't be included (like touchscreen) but I am hoping that NRS hasn't abandoned the console ones just yet without the Vita costumes. What do you think? The key is "console exclusive content". The Wii version of MKA got Goro and Shao Kahn, PS3 got Kratos, etc. Since the Vita is new, I would expect exclusive content for that platform to draw people to it. It would be nice if the content was shared on PS3 and XB, but the chances are zero; especially since "Komplete Edition" is out now and, well, the title says it all plus NRS has stated there is no more DLC in the works. Hey earlier on today i watched an interesting vid about the MK Komplete Edition version of the game. http://www.youtube.com/watch?v=NHm_SJ6gT2c Don't know if his friend is legit or not but wh should find out soon :P and also HOLY CRAP ITS MY 666 POST OH GOD OH NO!!!!!!!!!!!!!!!!!!!!! Apparently, the DLC kharacters do not always show up at the player select screen if you've downloaded them for the original MK9, you have to delete the DLC files from your hard drive for them to appear. Seriously? They couldn't even code the KE properly? Maybe, they didn't think the people who owned the og MK9 would buy the new one as well.